Bob realized at a young age that he had a talent for dancing. He won his first contest, a Twist competition, as a teenager and kept taking his dancing to the next level. 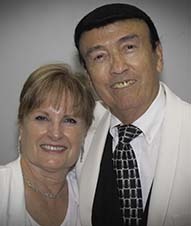 Bob has had intensive instruction in all ballroom dances and enjoys sharing his expertise. He is a natural as a performer and if you heard of Fast Feet Bob in the Disco Era, that was Bob Avila. He took many 1st place prizes in Free Style dancing, and his notoriety as a Street Hustle competitor would often scare away the competition. Bob and his wife, Suzi, became members a few years ago and are regular attendees. They often bring friends with them to introduce these friends to our Club. Bob is routinely asked for help from other instructors, because he is truly a Dance Diagnostician. He knows how to make the material understandable to the students, creating a fun, relaxed atmosphere. This ability is truly an art and the San Diego Swing Dance Club is fortunate to have this talented, versatile dancer as our March Instructor. Class is free with paid admission to dance!